From their strong belief that humanity played a central role in causing the climate crisis to their overwhelming dislike of President Trump, the young Americans who have been classified as Generation Z — comprised of those between the ages of 13 and 21 — could be even more progressive than the slightly older millennial generation, according to a Pew Research Center survey published Thursday. "Gen Z looks a lot like millennials politically, which is terrible news for Republicans," Acadia University lecturer Jeffrey Sachs wrote in response to Pew's survey, which found that 70 percent of Gen-Z'ers disapprove of Trump, 54 percent believe the planet is warming because of human activity, and 70 percent believe the government should be doing more to solve the nation's problems. "This data suggests there is a reason why Rep. Alexandria Ocasio-Cortez gets so much heat from conservatives — she and this new congressional class not only represent the demographic changes that scare some, but she embodies the ideological trends, too," argued Anthony Michael Kreis, visiting assistant professor of law at Chicago-Kent College. At 29 years old, the New York Democrat is the youngest woman ever elected to Congress. "There's real enthusiasm for diversity and government reform" among Generation Z, Kreis noted. On top of their progressive climate views, support for racial equality and inclusion, and disdain for Trump, Gen-Z'ers also strongly reject American exceptionalism, with just 14 percent expressing the belief that the United States is "better than all other countries in the world." More than any other generation, according to Pew, Gen-Z'ers also believe that society is "not accepting enough" of those who don't identify as a man or a woman. 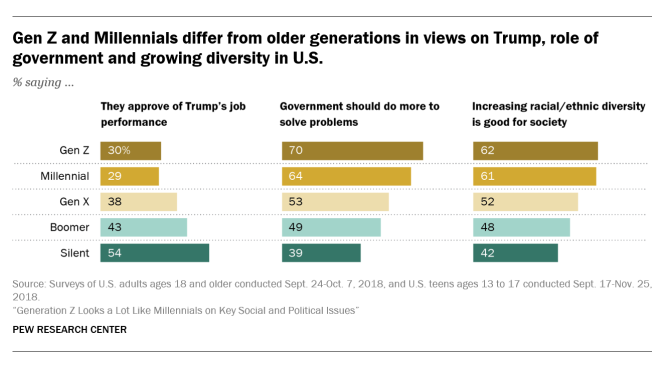 While Pew was quick to note that it is "too early to say with certainty how the views of this new generation will evolve" over the next several years, Kreis argued that the progressive bent of Generation Z could pose a serious threat to Republicans nationwide in the near future. "Generational replacement is going to a major hurdle for the GOP and [the Supreme Court]," he concluded. "There will have to be a leftward shift all around in the not so distant future or there will be no GOP to speak of and the courts will have a real counter-majoritarian problem."